Students who enroll for education in BSc Nursing and Post Basic BSc course have career opportunities in reputed hospitals of the country in both private and public sectors and abroad. They qualify themselves for the post of Staff Nurse and eligible for KNMC registration to practice in all broad and super speciality hospitals. On completion of the Nursing Course, a student is enrolled as Staff Nurse. The main task of a nurse is to assist the ward-in-charge in the day-to-day Management of the ward. The staff nurses learn the condition of the patient, assess and carry out the most appropriate procedures and medication administration which will benefit the patient. They give patients counseling, assist the doctors in the clinical rounds, supervise the students and other ward personnel, make supervisory rounds of the wards, meet the patients’ responsible guardian/parents, and discuss the patient care with them. 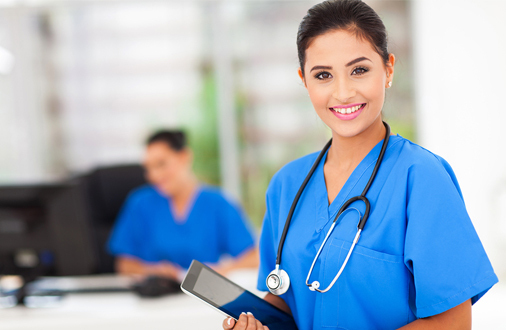 The Nurses have professional prospectus of rising to higher positions in the field of Nursing with commensurate attractive compensated packages. Higher academic qualification after Degree Programme includes M.Sc Nursing, M. Phill Nursing and Ph. D Nursing. This would enable them to get promoted to the level of Head Nurse and the Supervisory level positions. Vocational courses such as International Graduate and Postgraduate training programmes can also help nurses gain very good mileage in the career.